ASCII command support for all 1-Wire devices. Direct connection to UART or Microprocessor serial I/O. Automatic power up and power down. Automatically provides smart strong-pull-up for sensors. 1000 feet, 100 devices per CAT-5 twisted net. Provides Search, Family Search and Conditional Search. Block mode commands support all 1-Wire device functions. 5 Volt and 3.3 Volt operation. Supports Touch Memory File Structure for Dallas Semiconductor iButtons. Automatic CRC16 for TMEX files. Small size and low power requirements for hand-held and battery operated devices. 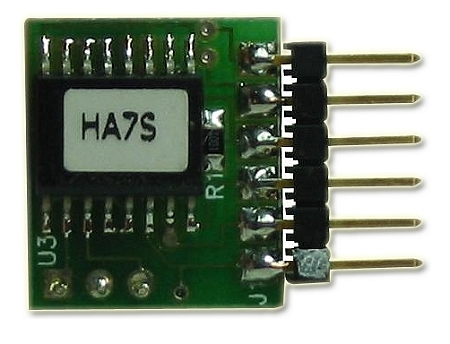 The HA7S is a TTL to 1-Wire interface in a very small 6-pin SIP designed to provide an ASCII command set for embedded controller and battery operated applications that need to accommodate Dallas Semiconductor iButton and 1-Wire devices. The HA7S relieves the host of the burden of generating the time-critical 1-Wire communication waveforms while supporting all 1-Wire devices with simple ASCII commands that can be easily generated. The HA7S does all the hard work of interfacing 1-Wire networks. Small size and very low power consumption as well automatic power-up and power-down features allow the HA7S to operate in low power and battery operated applications with no need for power control signals from the host device. 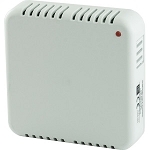 The only interface signal required is the TTL level TX and RX from a UART or microprocessor. The HA7S powers up into a very low power state. When a serial ASCII command is sent the HA7S will wake-up, process the command, send the response and power itself down. The 1-Wire bus can be left in a powered up or a powered down state while the HA7S is powered down. While in power down mode the HA7S has a very low quiescent current requirement of about 5 microAmps. The HA7S can perform Search and Family Search functions making it easy to acquire the unique 64 bit serial numbers of all connected devices. Many sensor devices require that extra power be delivered during periods of data conversions (DS1920 and DS1820 temperature sensors for example). The HA7S automatically provides the extra current these devices require with a built in smart strong-pull-up. Dallas Semiconductor iButtons which store data in TMEX Touch Memory File format can be read or written with simple ASCII commands. The HA7S will automatically generate and check the CRC16 error checks from Touch Memory File records. The HA7S supports analog, digital, and temperature 1-Wire devices and all Dallas Semiconductor iButtons. Q: It seems that HA7S module is discontinued. Is it still available through some distributor (in EU)? Does it have replacement, which works on a logic level? HA7S User Manual - supported browsers can view the User Manual below. alt : User Manual for Supported Web Browsers.